It’s a yacht club without a clubhouse, a marina or docks. Yachts also seem in short supply. Nonetheless, members of the South Whidbey Yacht Club remain afloat and eager for others to learn the finesse and fun of sailing. As it tacks into its 15th year this summer, volunteer members are once again leading sailing camps by day and skippering competitive races at twilight. And after dark? Time to socialize with like-minded old salts. At a recent Wednesday post-race gathering, some racers kept on damp clothes while others traded wet suits for fleece and wool hats. They dove into enchiladas, deviled eggs, chips, dip, beer, wine and conversation. “I just go out and have fun. It’s my level of adrenaline rush,” said Michael Scott, who grew up in England and started sailing at age 14 in Oxford on the River Thames. “It’s just so visceral on these small boats,” he said after nearly three hours zipping back and forth up and around the waters of Holmes Harbor in a Laser boat. The first race started out rather dull but sudden weather changes turned calm seas into chop-chop rollers. Ken Sasson’s desire to pass along the love of sailing and teach the ways of winds and tides was how the club got its start in 2003. He wanted to make boating accessible and enjoyable for all ages. “We were sitting around the bar one day and Ken says, ‘We ought to have a yacht club for the social part — and to give youth sailing lessons,’” Brown recalled. Word got out and soon a variety of sail, power and human-powered boats banded together to form a club. There are about 100 members today. South Whidbey Yacht Club holds a series of races May through August for small sailboats called San Francisco Pelicans. Wide and sturdy, they sport a gaff rig that takes two sails and look like shrunken pirate ships. Members also race a class of boats called Lasers, much sleeker, faster sailboats that resemble surfboards with a small cockpit. Unlike traditional yacht clubs, there’s no fancy clubhouse, no exorbitant dues and no dress code. But there are officers, racing rosters and a club logo on a flag, called a burgee. The educational part took a few years to establish. First, the club needed small boats for small bodies to navigate. So members scoured old barns and yards for small, wooden dinghies, fixed them up and soon had a fleet of El Toro pint-size sailing dinghies. Founding Commodore Sasson didn’t live to see the Youth Sailing Association take off but one of the colorful, sturdy vessels is named in his honor, The Sass. It’s among the fleet of El Toros pulled up on shore of Deer Lake one morning. Among their names painted along sterns: Tanker, Daisy, Lipstick, White Caps. Here’s where the sailors of tomorrow are learning to read the wind and water during a week of instruction. Camper Colin Byler is taking a beginner sailing class for the second year in a row because a friend wanted to join him in class. He then plans to take the intermediate class, also taught on Deer Lake. 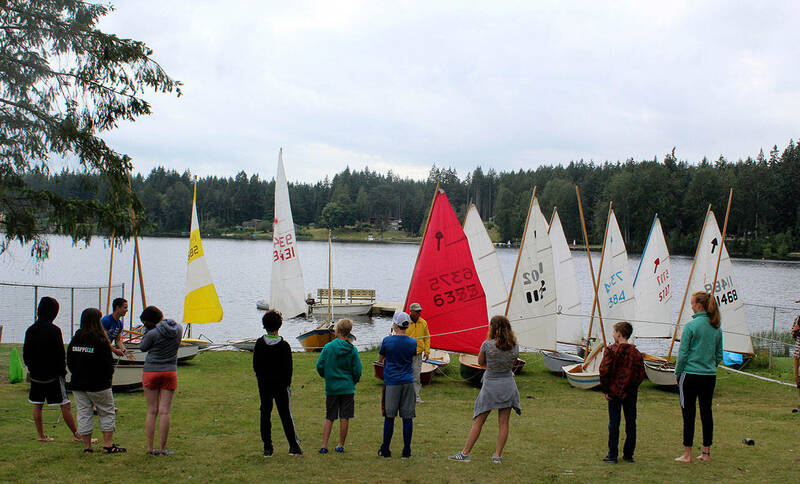 The youth and adult classes are offered through South Whidbey Parks and Recreation and taught by South Whidbey Yacht Club members. Byler gets an 8-foot-long El Toro ready, then Brown gives him a push from shore. During a youth sailing program, Colin Byler gets a push off Deer Lake beach by instructor Bill Brown. Perry Lovelace and Peter Bunin pick up a gust of wind during a recent race. “We exist to teach people how to sail,” Lovelace says of the South Whidbey Yacht Club. Two sleek sailing boats called Lasers pass each other during a Wednesday evening race of the South Whidbey Yacht Club. A safety boat is on patrol during all sailing races to help when boats capsize. Wearing wet suits is recommended in case sailors spend more time in the cold water than anticipated. Students in a recent beginning sailing class on Deer Lake line up to play a game that teaches balance. They spend a couple hours each day in the little wooden El Toros 8-foot boats learning the ropes and how to read wind and current. Classes are taught by the South Whidbey Yacht Club through South Whidbey Parks and Recreation. Evan Chappelle checks the rigging of his sailboat before heading out during a youth class on Deer Lake. Because of his size, Chappelle opted to learn on a longer Pelican boat than the 8-footer El Toros used by other students.